A few months ago (wow, has it already been months?) I wrote about The Damned Lands – an unexplored area of land psionicly irradiated in some unknown incident that was ripe for exploration. Staying within The Damned Lands for too long is harmful as there is a creeping disease, The Madness, which works its way into one’s mind and heart, but leaving The Damned Lands too soon robs a person of its greatest reward – superpowers. Take a look at this excerpt from the Exploration Age Campaign Guide. Let me know if you think the risk/reward balance is correct here. Note: Every month in Exploration Age is exactly 30 days. None of this 31 sometimes and 28 once a month, except for every four years (looking at you, February). Also, the only thing worse than an extended stay in The Damned Lands! As adventurers spend more time in The Damned Lands, they risk becoming infected with The Madness. Every ten days straight spent in The Damned Lands, a creature must make a successful DC 15 Wisdom saving throw or contract The Madness. For every ten days beyond the first spent in The Damned Lands, the DC for the saving throw increases by 1, since The Madness becomes more difficult to resist as more time is spent in The Damned Lands. Once a creature is infected with The Madness, roll on the table below to see how it specifically is affected. 1 Target abhors all life except for itself. It attacks and kills any living creature it can sense. 2 Target is called by a mysterious force toward the center of The Damned Lands. Anything that gets in its way or tries to stop it is immediately attacked. 3 Target weeps uncontrollably and sits down. It will not eat or drink, but only sit and cry. Anyone who tries to move or comfort the creature is attacked until they leave the creature alone. 4 Target develops a taste for the flesh of humanoids. It hunts and kills other humanoids whenever it is hungry. The target refuses to eat anything else. It is advised that if a PC become infected the GM and player have a conversation about what this means and possibly have the GM take control of the character. There is currently only one known cure for The Madness (though there may be others out there). An infected creature must be killed, have its body burnt to complete ashes or dissolved in acid, and then brought back to life via true resurrection spell. Doing this cures The Madness, however the process is expensive and also removes any psionic abilities the infected acquired from long-term stay in The Damned Lands. It can’t buy everything… but it comes close! There are two types of psionic abilities that can be acquired by staying within the borders of The Damned Lands, minor and major. Any creature who survives a continuous month or longer in The Damned Lands has a chance (at the GM’s discretion) to acquire a minor ability. The GM may choose or roll on the table below to grant a creature a power. 3 You can move an unattended object within 30 feet weighing 20 lbs. or less 30 feet in any direction as an action. 4 You can cause an unattended flammable object within 30 feet to catch fire as an action. 5 You can teleport an object being held 50 feet (this includes into the hands of another person) as an action. 6 You can teleport yourself 25 feet as a move. You must rest before doing so again. 7 You can heal yourself once per day an amount equal to your Constitution score as an action. 8 You gain darkvision out to 60 feet. If you already have darkvision, you now see in color in the dark. 9 You can speak with animals per the spell at-will. 11 You can create psychic claws which are light finesse weapons which deal 1d6 psychic damage. You are proficient with these claws. 12 You gain blindsight out to 5 feet. 13 For one hour per day, you can increase your speed 10 feet. 14 You can use the feather fall spell at-will. 17 You can throw psychic knives which act as daggers and deal 1d4 psychic damage. Any creature who survives a continuous three months or longer in The Damned Lands has a chance (at the GM’s discretion) to acquire a major ability. The GM may choose or roll on the table below to grant a creature a power. 1 You gain a fly speed of 60 feet. 2 As an action you can become invisible at-will. 3 You regenerate 5 HP at the start of your turn. If you lose consciousness, you lose your psionic focus and cannot regenerate until you regain consciousness. 4 Your speed is tripled. 5 As an action you can summon a psychic pet which has the same statistics as a triceratops. You may only summon one creature at a time. The creature disappears once reduced to 0 HP. You must rest before using this ability again. 6 As an action you can read a creature’s mind. They are allowed a Wisdom saving throw (DC equals 8 + Charisma modifier + proficiency). If the saving throw succeeds you cannot try to read the creature’s mind for another 24 hours. The target does not know you are reading it’s thoughts unless it has magic or psionic means of detection. 7 You can breathe underwater and gain a swim speed equal to your own. 8 You gain a burrow speed equal to your own, tremor sense out to 60 feet, and blindsight out to 30 feet. 9 You gain advantage on saving throws against magical effects. 10 You can blink in and out of the ethereal plane as per the blink spell. You can activate this ability as an action at-will. 11 You can teleport 15 feet as a move. 12 As an action you can use dispel magic at-will. If you have no magic ability modifier, it equals your proficiency plus your Charisma modifier. 13 You can use time stop. You must before you use this ability again. 14 Once per day you can cast true resurrection without any material components. 15 Once per day you can use foresight on yourself. 17 You can use antimagic field. You must rest before you use this ability again. 18 You can use telekinesis per the spell at-will. 19 Your Strength becomes 26. 20 Your Intelligence becomes 26. So you can see the idea here – PCs can get powers for surviving in The Damned Lands if their GM allows, but they have to risk their sanity and make increasingly difficult Wisdom saving throws, not to mention all of the horrific monsters and environmental hazards of The Damned Lands. Let me know if this all makes sense to you. Did I leave your favorite power off the list? Tell me! I want to make The Damned Lands worth it! So I know a lot of you have already taken this poll, but if you haven’t please take 20 seconds and read the one question and answer below, even if the answer is “No, I hate your stupid blog.” I’m making an Exploration Age Campaign Guide (release date sometime 2015 once the Wizard’s OGL is released) and I’m interested to see if people would actually want that. Thanks! 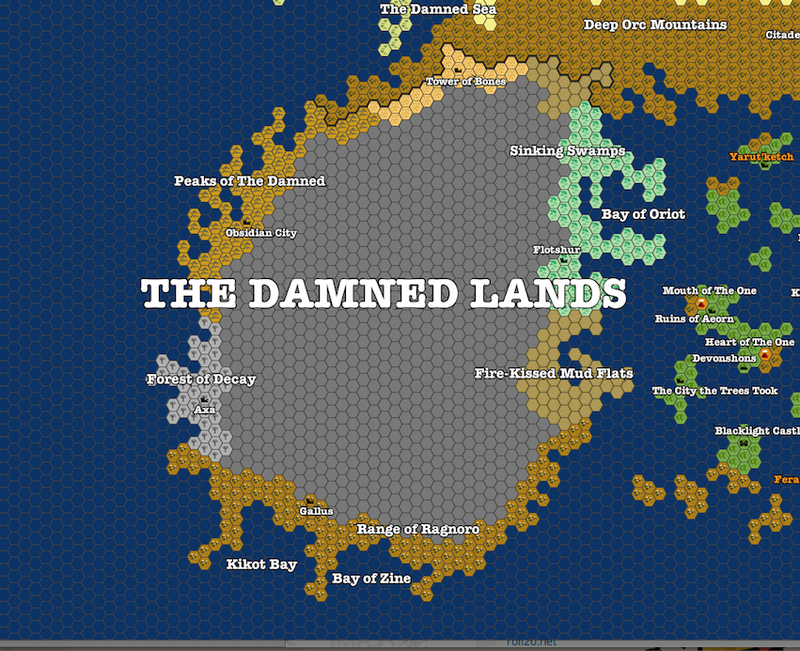 Hmm, what software do you use to draw your hex maps. I love it. This is a great idea. When I read your earlier post in which you mention the Damned Lands, I was onboard, and now that you fleshed it out I f###ing love it! High risk high reward, intriguing mysterious possible back story, all kinds of crazy monster, npc, pc encounters. Love it! Hooray! Well, hopefully this makes up for the planes thing…. I like this a lot. I’m always excited about high risk, high reward scenarios! One suggestion to level the playing field- let the pc’s use either wisdom, intelligence, or constitution for their ability check. Letting them choose isn’t a bad idea at all. It’s, at the very least, a good variant to throw in there for those who want a slightly less deadly Damned Lands.